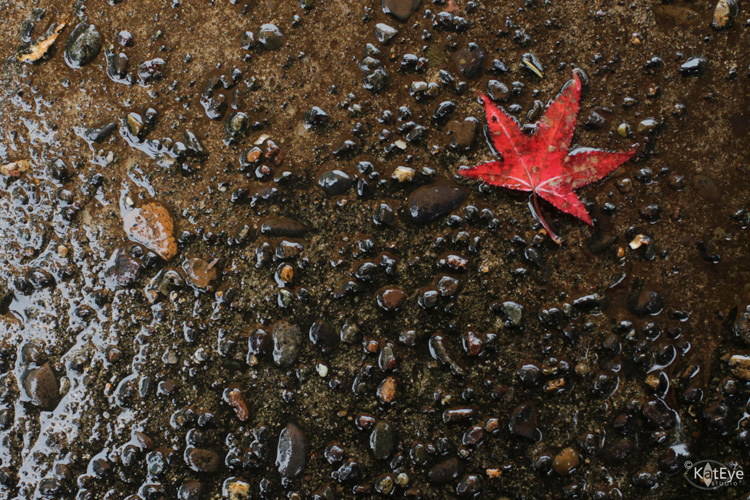 One of the best tools a photographer has to create a powerful photograph is contrast. Today in Exploring with a Camera, I’m going to talk about the concept Visual Contrast and how it can help you create interesting images. At the end of the post, there is a link tool for you to link in your images on the theme, either new or archive. I hope you’ll join in! In our study of light and exposure as photographers, this is an obvious kind of contrast. Our camera, which has a limited dynamic range (range between light and dark) compared to our eyes, almost creates this type of contrast for us. For this theme, let’s look beyond light/dark contrast into other types of contrast that are more subtle but just as powerful for creating images. 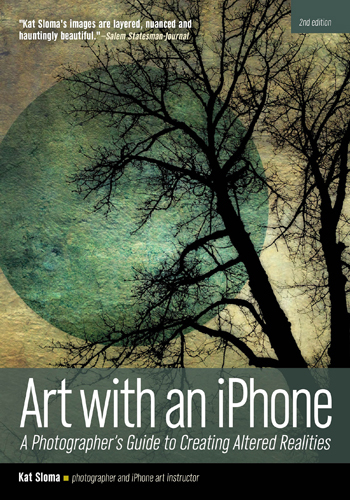 The idea for this theme comes from Michael Freeman’s The Photographer’s Eye. In this book, he refers to a list of contrasts created by Johannes Itten, a Swiss painter and teacher at the Bauhaus school in the early 1900’s. Itten developed some revolutionary ways of looking at basic artistic concepts as part of his “preliminary course” on art. Using contrasts to create interesting compositions was one of his ideas. While these contrasts were original intended for painters and other fine arts of that time, they work just as well for photographers today. 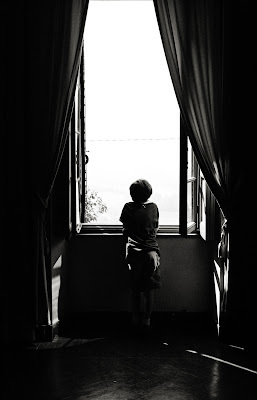 This photo is one of my favorites of my son’s early years. It’s one of the few prints from my film days I actually have here in Italy, and I was happy I had it available to share with you for this theme. 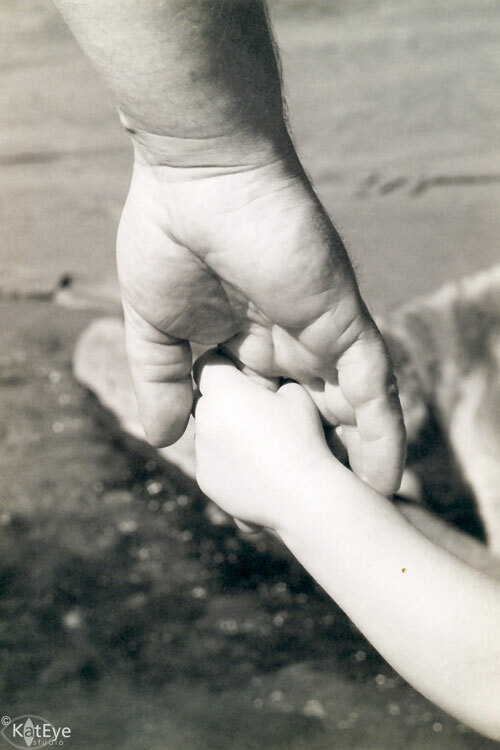 I love the large/small contrast between the hands of my husband and son. There is also a parallel old/young contrast in this image. Our travels around Europe have provided us with plenty of examples of contrast between old and new. This image of a Roman theater at the foot of the Acropolis in Athens is an especially clear example of old/new. 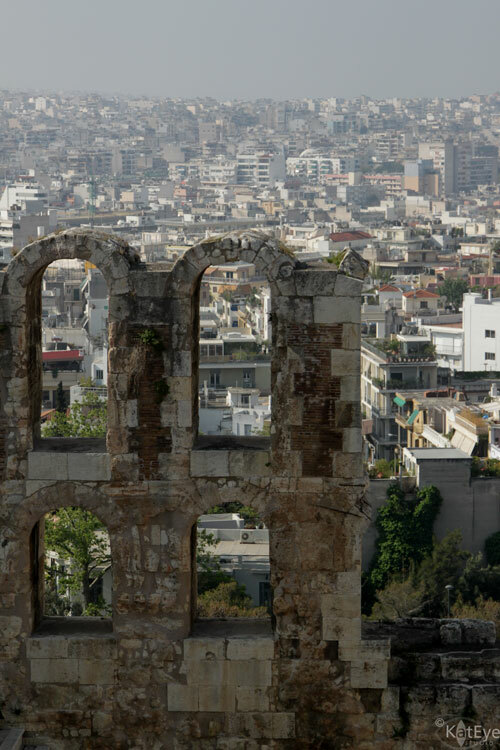 Millenia old ruins against the backdrop of a large, modern city. Quite a contrast. 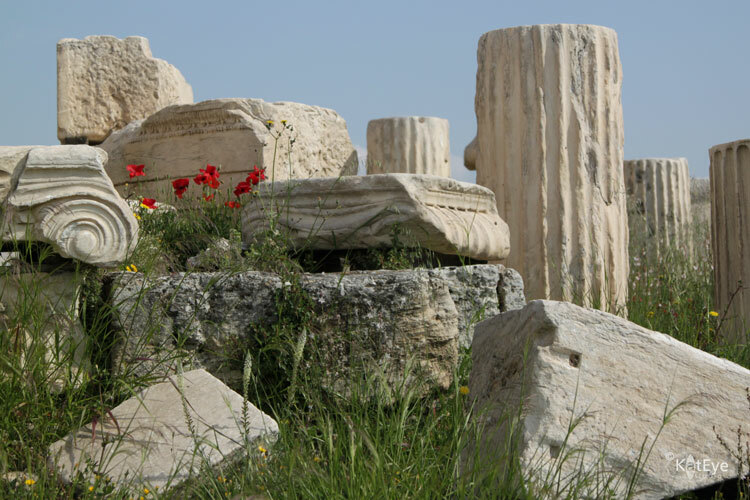 Along with old/new, visits to ruins can give a great contrast between natural and man-made. 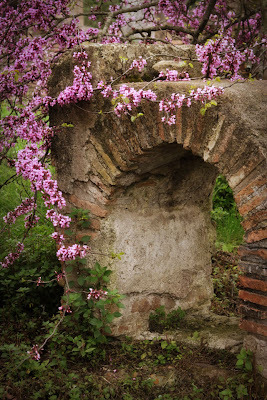 I love showing decaying ruins along with thriving nature. It makes quite a commentary on the permanence of what we create in the larger scheme, doesn’t it? The opening photograph of the poppies and the Greek ruins at the Acropolis, and this image of a blooming tree by the Roman ruins of Ostia Antica near Rome are good examples. 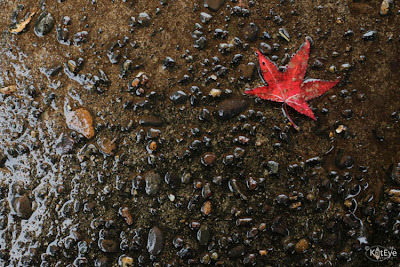 The hard, rocky pavement contrasts dramatically with the soft leaf in this image. The image also includes the contrasts of many/few and bright/neutral color. Just being back from Greece, you didn’t think I could go a day without showing some white and blue, did you? 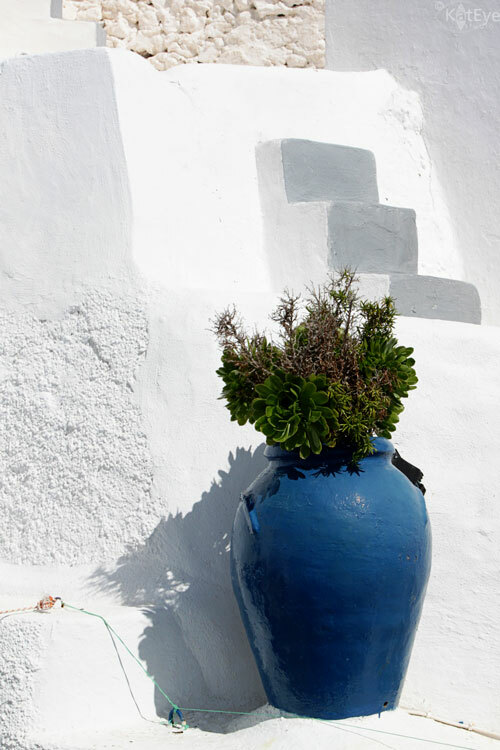 The bright blue pot against the neutral white background is a strong contrast of color. The popular technique of a black and white image with selective color showing takes advantage of this type of color contrast. 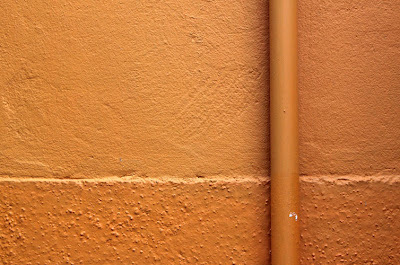 This image also includes contrasts in smooth and rough textures. 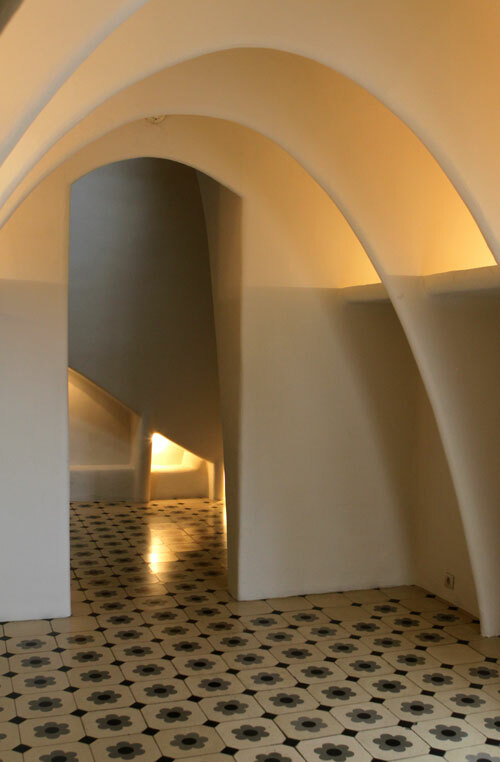 The straight, geometric lines of the floor contrast with the gentle curves in the walls in this image from Barcelona. The contrast is further enhanced by the softer, underfined edges on the curves versus the very hard and defined edges of the lines in the floor. 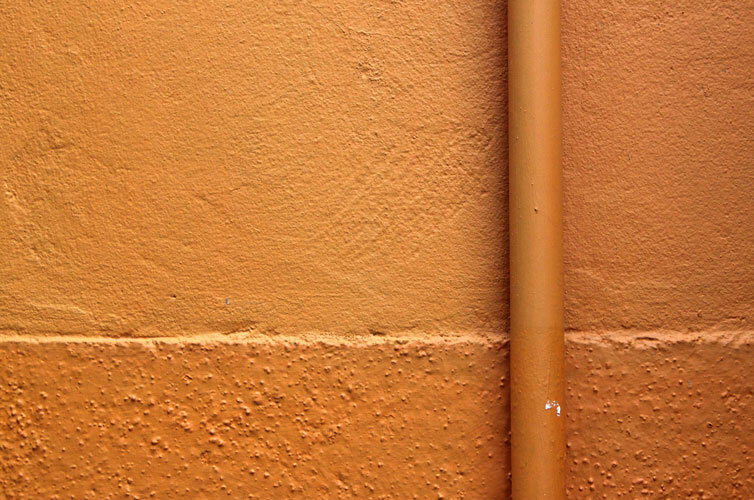 The variation in textures is the main contrast in this photograph from Burano. The contrast created by light/dark also helps define the edges and separate the different textures. That’s enough examples to get you started! I’ll share more over the next couple of weeks as we explore this topic. I was actually surprised at home many I came up with, once I started looking. Now it’s your turn. Take a look through your archive or go out with your camera this next week or two and look for Visual Contrast. Then, come back and link in the images you found in this post and/or add them to the Flickr pool. How many contrasts do you think we can find as a group? I can’t wait to see! Don’t forget to comment on this post, if you have ideas for other contrasts to include in the list. 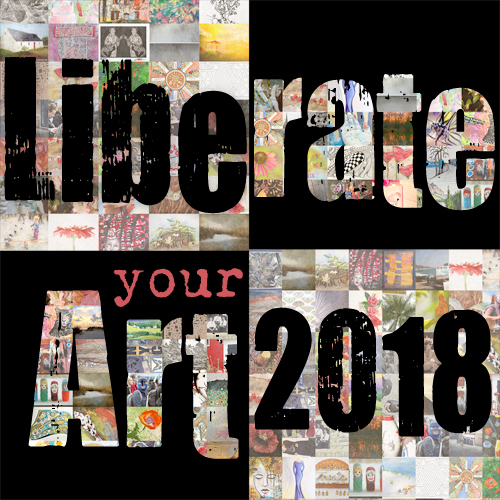 If you haven’t already, sign up for the newsletter and you’ll get a printable list of Visual Contrasts in your email this Sunday. Nice post Kat. I remember doing some of this on a photographic course I took once. I'll see if I can find anything. Great idea! I thought about a picture I took a few weeks ago at a tulip festival in Switzerland – the blossom is focussed and the green leaves are all blurry! Great post Kat. Certainly has me thinking differently about using my camera, thanks. I've been feeling in a slump. Spring flowers are nice and all, but they are starting to fade as is my interest in them. This will be a fun topic to explore — it has so many possibilities. I'll be thinking about contrast when I use my camera in the next few days. Thanks again for an informative post! I am super excited about this prompt! Thanks for such an awesome write up! So much great information Kat, and such wonderful examples! I'm so inspired! 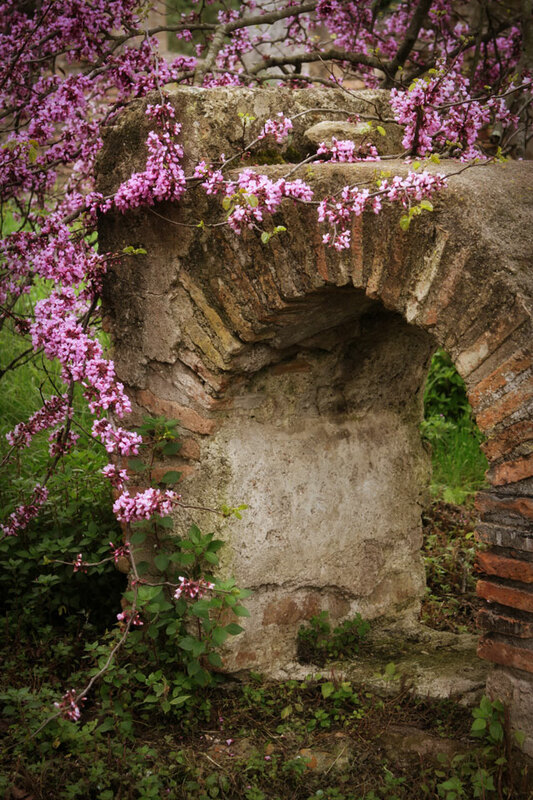 I want to go find something that is beginning and ending–what do you think of that? I love it! I think the whole opposing forces-opposites really attract me! Thanks for the new way to see things. fantastic post. it gives me a lot to think about! love it. Very interesting and thoughtprovoking post. Walking outside today I was struck by the contrast of living/dying in nature – already there are flowers withering while the world around them explodes with life. It is amazing how many opposites there could be or simply a contrast of light and dark! I went for color and black and white and then contrasted the image further by abstracting the image…my first time linking up, thanks! love this prompt kat! there are so many possibilities. 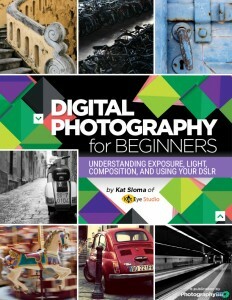 Great info here and great photos!! I always enjoy learning something new when I visit your blog! Thank you! Your photos are wonderful! I really enjoyed this prompt, I love how you always give me something new to explore and really open my mind to find something creative.